Regalia that belonged to Chief Crowfoot, a legendary Blackfoot leader, may soon return home after sitting in a British museum for more than a century. The Royal Albert Memorial Museum in Exeter, England, has a Blackfoot collection that includes Crowfoot&apos;s deerskin jacket, leggings, a bow and arrow and a ceremonial knife. "We had no idea the collection was there," said Herman Yellow Old Woman, a cultural curator at the Blackfoot Crossing Historical Park museum east of Calgary on Siksika Nation. He is working with the museum in Exeter to repatriate the regalia. "I feel like we&apos;re bringing his spirit home." "I was just open and honest about it and said, &apos;Well, isn&apos;t it about time Crowfoot came home?&apos;" said Tony Eccles, curator at the Royal Albert Memorial Museum in Exeter. "Repatriation is also a process of healing. This material allows us to talk about our colonial past," he said. The museum has been researching its Blackfoot collection recently and invited a Blackfoot delegation to Exeter in November. Herman Yellow Old Woman was part of it. "We had a pipe ceremony right there at the Exeter museum with the officials and it was such a moving, powerful feeling," he said. "Even talking about it now, I still feel the goosebumps that I got." For Yellow Old Woman, there&apos;s no question where the regalia belong. "To bring back these artifacts to our community will give us a sense of pride," he says. "Our children are starting to lose their identity and I think for these kinds of artifacts to come back will give them a boost and a positive energy to connect back to who they are as Blackfoot people." The Royal Albert Memorial Museum purchased Crowfoot&apos;s regalia from Cecil Denny in 1904 for £10. Denny was a member of the Northwest Mounted Police and later became an Indian Agent for the Treaty 7 region. "Over the years Denny became friends with Crowfoot," said Eccles. It&apos;s not clear how Denny acquired Crowfoot&apos;s regalia. "All we have, in a number of surviving letters, is information that says that Denny had acquired Crowfoot&apos;s regalia at Bow River. It doesn&apos;t tell us when, how or why," said Eccles. Now that the contents of the museum&apos;s Blackfoot collection have come to light in Alberta, local historians are impatient to see Crowfoot&apos;s regalia back home. "My first reaction to finding out his regalia is in Exeter is — what the hell is it doing there?" said Calgary historian Aritha Van Herk. "Every effort should be made to secure them, to bring them home, and to honour his memory. They must be here. There&apos;s no question about it," she said. Crowfoot was a Blackfoot chief at a turbulent time — bison were disappearing and his people faced disease and starvation. 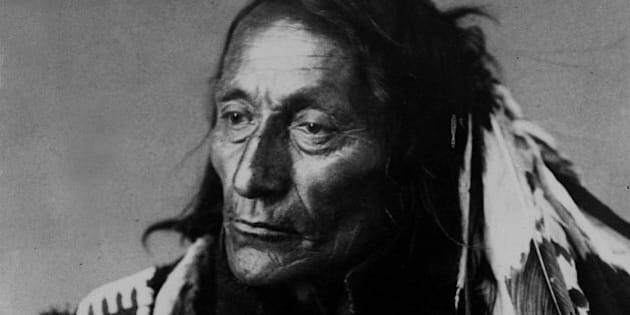 "People looked up to him and respected him and without that I think things wouldn&apos;t have turned out the way they did," said Yellow Old Woman, describing Crowfoot as a generous man who was devoted to his people. "He was a very important person when it came to peace." He was born in 1830 along the banks of the Belly River in what is now southern Alberta, according to the Aboriginal Multi-Media Society. His bravery during a raid against the Crows, who were bitter enemies of the Blackfoot Nation, would earn him the name Isapo-Muxika, or Crow Indian&apos;s Big Foot. Interpreters translating the language of Blackfoot into English would later shorten his name to Crowfoot. Crowfoot signed Treaty 7 in 1877. He was lauded by politicians in his time for being a great friend of white settlers, but Van Herk says that wasn&apos;t his objective. "He was wise enough to know that this endless tide of white people was not going to go away," she said. "He was really concerned about the security of his peoples — their ability to stay on the land." After a long period of failing health, Crowfoot died on April 25, 1890. Herman Yellow Old Woman plans to bring Crowfoot&apos;s regalia to the Blackfoot Crossing museum next spring. He envisions an exhibit that could travel to other Alberta museums, but says it will likely cost tens of thousands of dollars to pull together. British government officials also still have to approve the repatriation. "I don&apos;t see local authority permission for this being an obstacle. The only obstacle I really see is resources and funding," said Eccles. Yellow Old Woman is hoping to get help with the repatriation from the provincial and federal governments​, Siksika First Nation and Alberta museums.